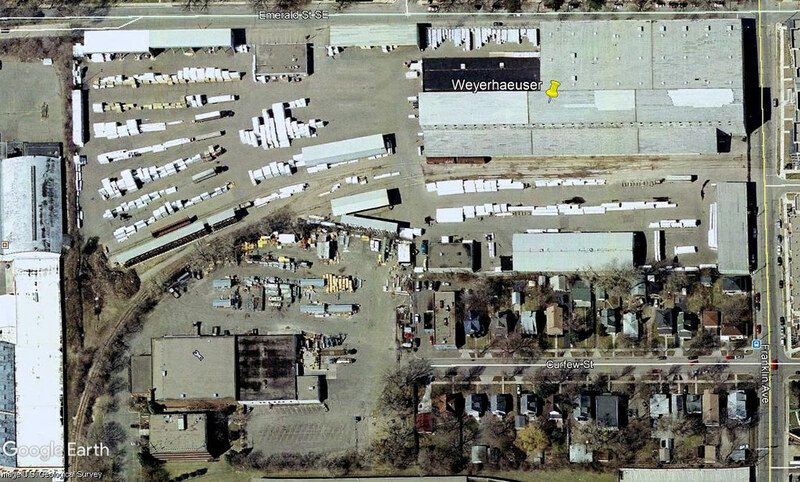 A couple of nice chats with @BOK Barry K at both the retreat and the Randolph MN swap meet the following week helped me focus on the old Weyerhaeuser facility here in Saint Paul Minnesota. 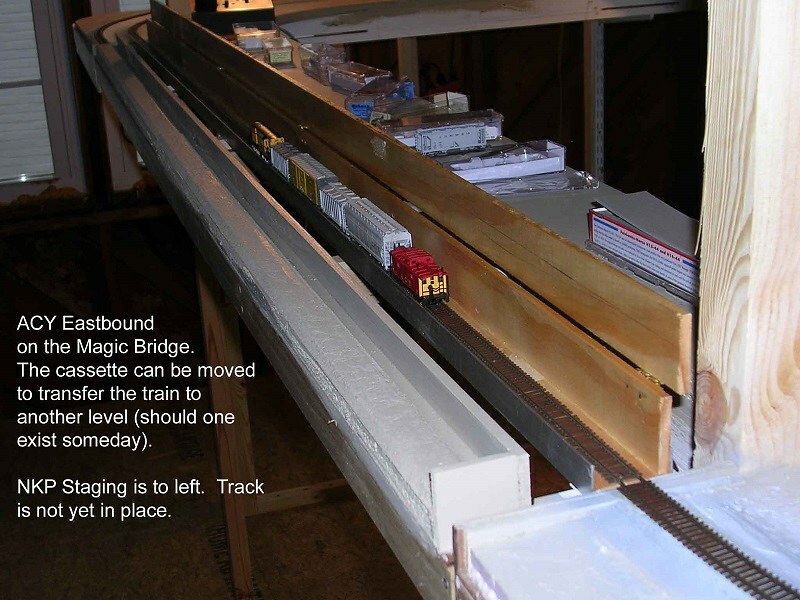 The facility would be about 8' long in N scale, I compressed it roughly to 50%, retaining enough spots for up to 3 centerbeams and 5 boxcars. Some turnouts had to be flipped and rearranged, but I believe operations are left largely faithful to the prototype. 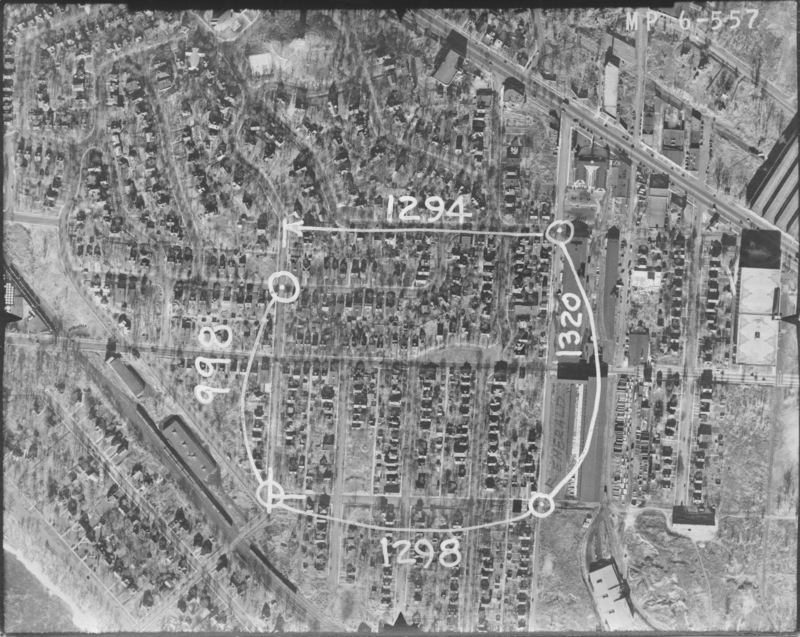 The long spur to the east (bottom of the aerial) was out of service as of Barry's time, and I excluded it in the initial plan. It can be added to the layout without a shoehorn though, and since it was actually there I'll make an effort to add it as a cosmetic spur. As for the history of the facility, some kind of material handling was on site as early as 1938. 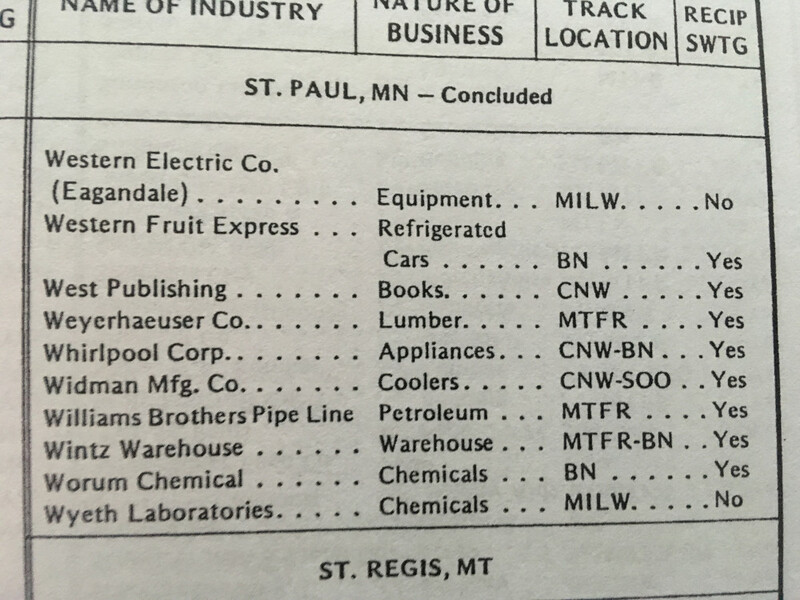 My copy of the Milwaukee Road List of Industries 1976 lists the facility as being served by the Minnesota Transfer, which would be passed on to the Commericial in the late 80's. The facility closed in 2015, and having been demolished a large apartment complex is now being built on the land. As for era, Atlas has a nice variety of Minnesota Commercial equipment for more recent times. If I could find the art and make some decals for the old Transfer, a black SW1500 would be sweet. Or an RS2, I have a Kato undec floating around. Or use one of my Milwaukee engines on loan... late 70's into the 80's is my jam after all. I've been bolstering my roster of double door and door-and-a-half boxcars and centerbeams lately, and if I could find a few more WoT bulkheads I'd really be rolling deep! Does the track crossing the road keep going in real life or is it really only long enough for one locomotive? Good luck with the new layout, Lucas! 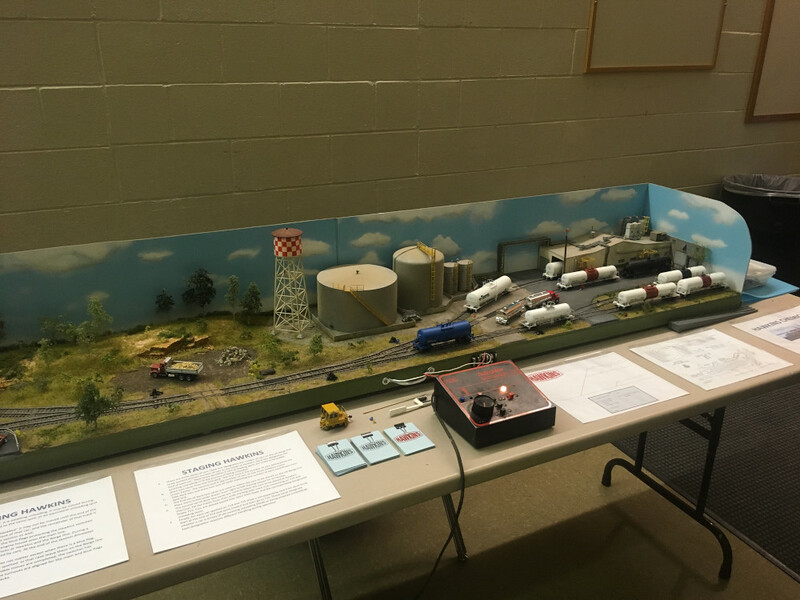 And thanks for the link to the Minnesota Modelers Retreat. I was also at the show in Randolph last week. I was hoping to have a few guys over for some low-key ops last Saturday after the show, but work/life interfered. If you're a Randolph regular, let me know and maybe you can join us next year. Always a fan of Twin Cities stuff. The SW1500s were not black but a dark green. Nice. I enjoy watching this kind of proto based project. I'll see if I can find a photo of my cassette. Easier said than done. Found it in record time. Amazing. Essentially three pieces of 1/4" x 1-1/2" trim stock reinforced with aluminum channel. 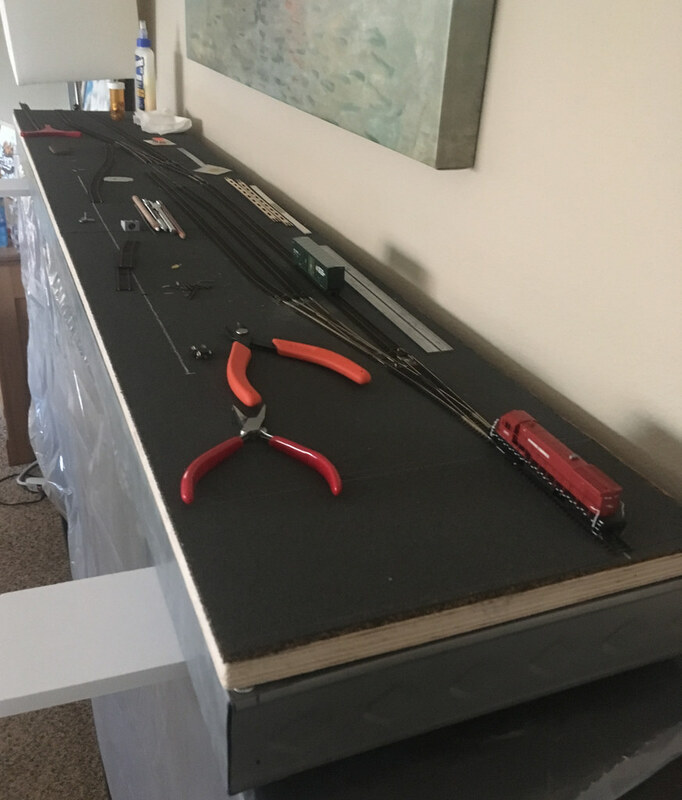 The top piece is hinged and was intended to have a foam strip (foam weather stripping perhaps) to stabilize the train as the cassette was being moved. While I've used the cassette numerous times I've never used it to move trains from level to level. 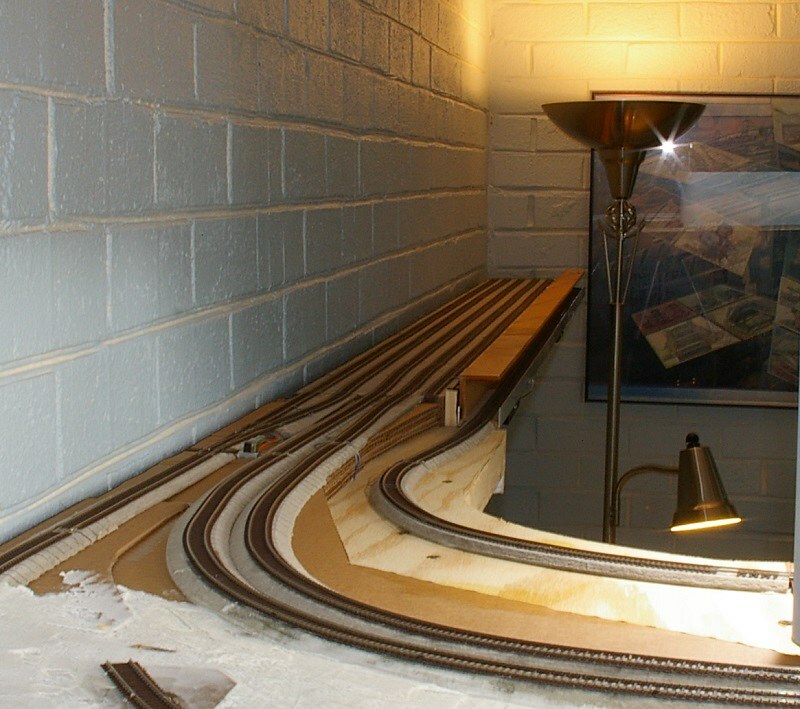 The other two photos show it in use in another version of the AC&Y layout. Geez, the first photos is 13 years old. If nothing else I can tell you the design in lightweight and rugged to have survived this long. Do you have the Minnesota Commercial timetable and handouts from the late 90s? Jim, it's too bad we missed each other at Randolph. It was my first time down but being a good show I'll be back, we'll stay in touch. Will you be at the TCMRM show at the Fair in May? Feel free to PM. I can't recommend the Retreat enough. It was my second year attending and it's well worth the price of admission. 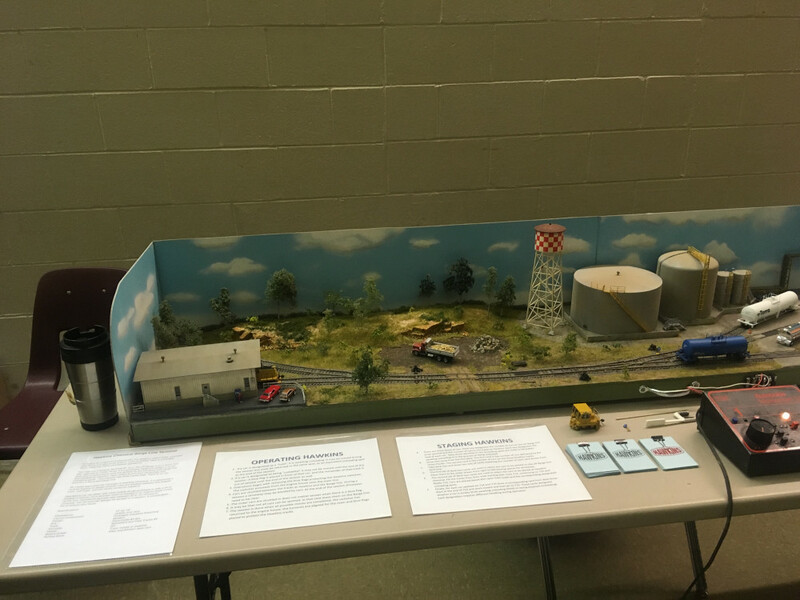 The clinics I've been a part of are well done and informative, and it's a good time browsing the display tables and mingling with the prototype crew. Jason, thanks. I'll admit the only MTRY photos I've seen have been pretty low quality, hence the black. 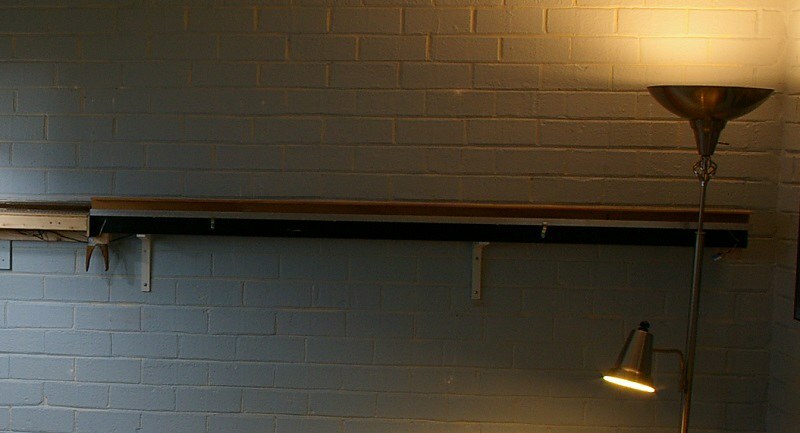 Is there a certain shade of dark green, or is this PRR Brunswick green situation? Granted this little project would be a ways out yet, but it might be worth a trip to the Illinois Museum to paint match 200, since the S-1 in Oelwein looks to still be blue. SAH, thanks for the kind words and photographs, more than I would have expected I've got some ideas percolating involving aluminum stock of various styles, so it seems I'm on the right track (har har). The testament to durability is a huge selling point. 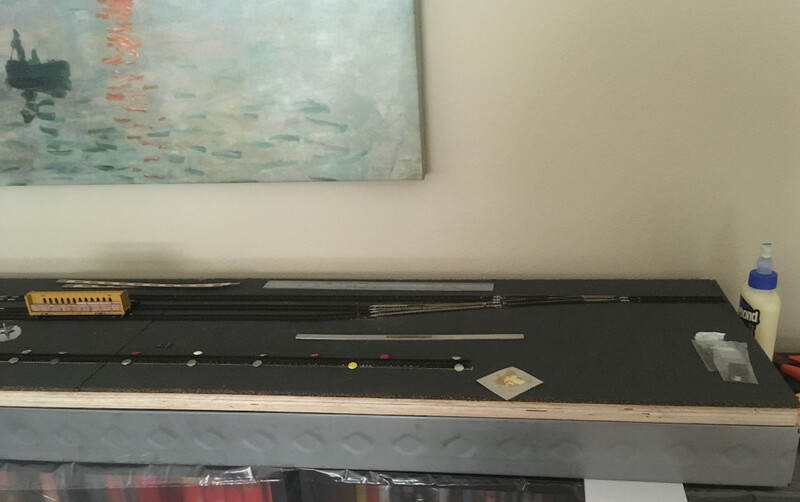 I'm hoping for a lightning bolt of inspiration, like when I had the 3/4" plywood cut and laying around for a week and really did not want to mess around with wood benchwork for the umpteenth time. Saturday morning I had a moment of clarity and recalled steel studs, which I have done in the past. By the afternoon I was done, no mess or fuss. Or all the extra weight for that matter. Ryan, thanks- all I have for the Commercial is a late ninties study on the Hiawatha corridor, describing the mills in detail. Where can I get my hands on this juicy info? It looks like you're off to a great start, Lucas. 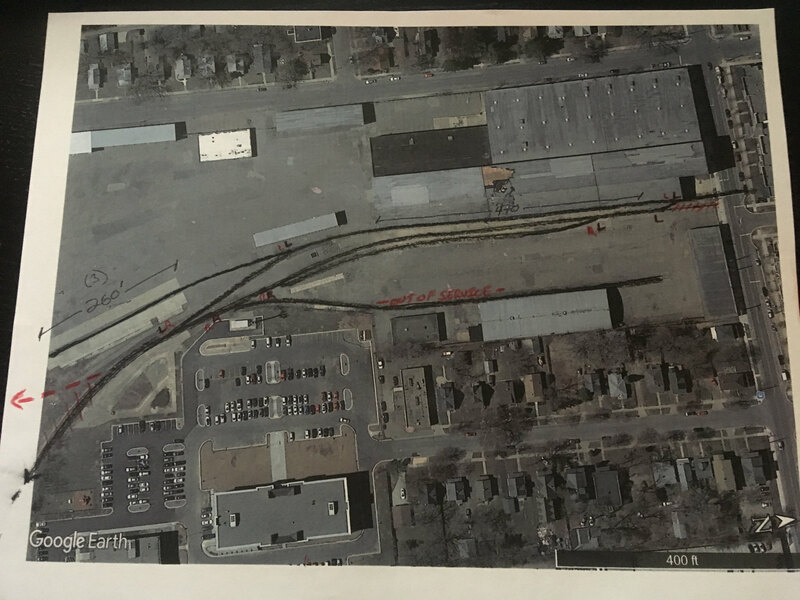 It appears that years ago there was some sort of industry on the other side of Franklin Street. Found this old Topo online but do not know the date. Thanks for the kind words Barry! Jon, nice find. Suspicious with the buildings being different colors, could be related to each other or not. So with some investigation, being that I94 is on the map, it's later than the mid 60's (94 was completed between Minneapolis and St. Paul in 1968) A bit of local history: Como Park Junior High (as it is on the map) became a high school in 1979. So my guess is the topo is from between '68-ish to '79. And the topo map reminded me to look up Sanborn maps. 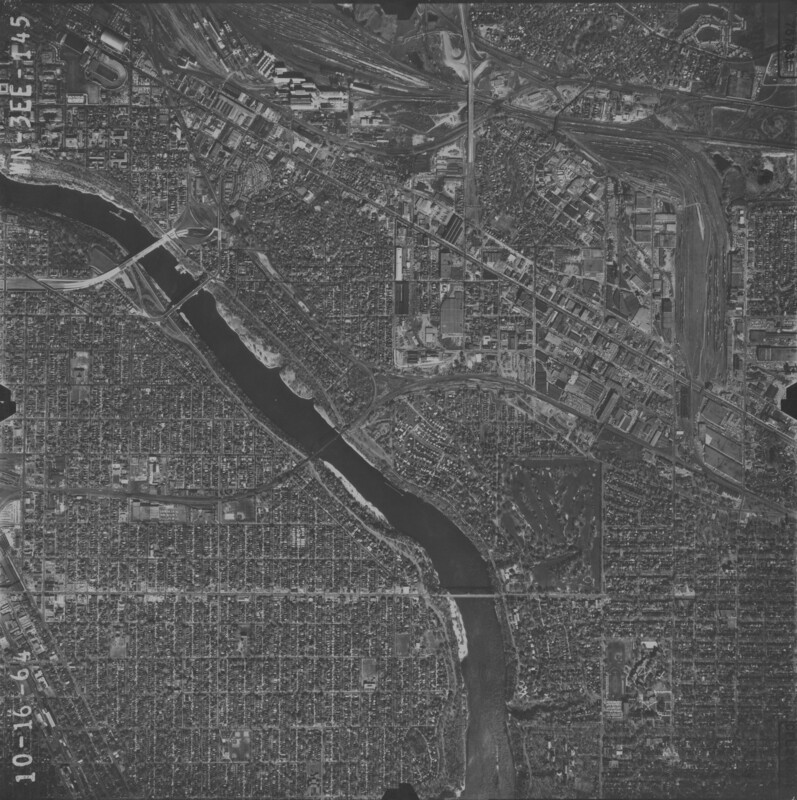 Problem is that the only digitized St. Paul maps are from 1880's to 1904 and don't cover the neighborhood I need. Bummer. The B23-7 is sitting across Franklin for reference. Some things have been changing, decided to run the cassette off the end of the layout, losing the prototypical curve but will save some engineering headaches. Also, My track plan is done with Atlas #5's for ease of CAD work, but I'm using ME #6's, so some geometry is changing slightly. I'll update the track plan once track is finalized. 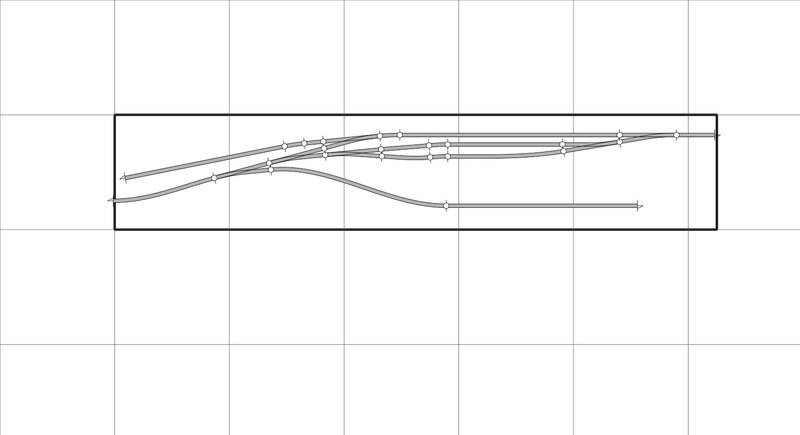 That first draft track plan in the top post might be the best adaptation of prototype track arrangement to modeling constraints I've ever seen. And a 50 percent compression ratio? It's almost a shame to pass that up. 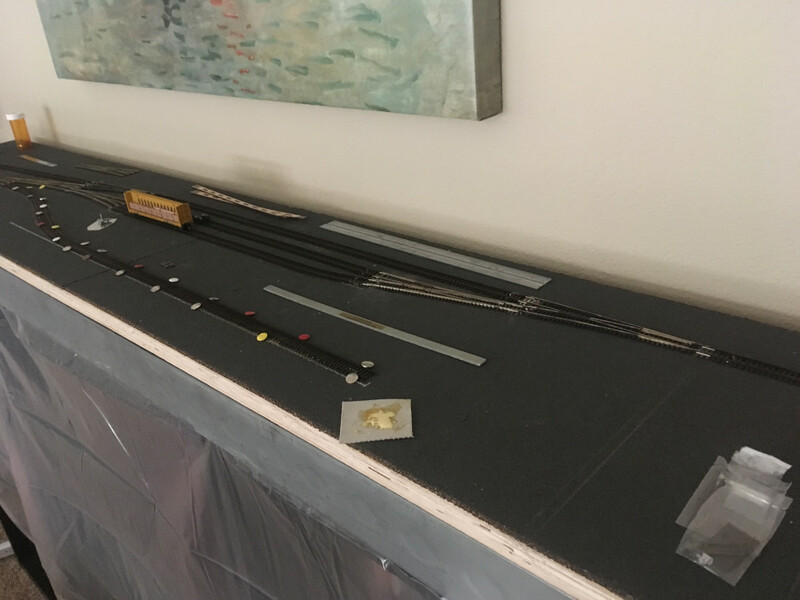 So I using the handy scale in the corner, it should be 90" long in N scale, minus the lead. Given that I have 63" to work with, it's 70% compressed on the nose. Not as bad as I anticipated, but enough to notice while redesigning it. But like I've mentioned, lopping off 30% and keeping operations is a good place to be. Hopefully this weekend I can collect the materials for the cassette, a plan is brewing.